We are so excited to offer, in November 2010, a journey through Egypt and Jordan. The ancient architectural treasures of Egypt, its’ Pyramids, Tombs, Temples and Statues, are landmarks that signify the locations of potent energy grids, crystalline energy structures and interplanetary vortexes. We will connect to the powerful Egypt of the past, when people were more awake and had the conscious ability to sense energy, talk to spirits and know about the mysteries of life as Reality. Being physically present in Egypt can lead to an accelerated opening of the power centers within the body, and this translates into more Self awareness and Self love. The search for the personal inner knowing of Truth, called Maat, and the experience of subtle vibrations, is enriched through direct interaction with the sacred geometry of these ancient temples. In Jordan, we will focus on the energy of inner Peace that is felt when the heart opens. There are two paths to it, the male and the female way. In the male approach the ability to connect to and understand the cause of pain, is what allows the vibration of cooperation between the opposites to generate passion, a ‘dynamic’ peace. In the female approach the ability to forgive that which causes us pain, is what allows the vibration of love to amplify, grow, and ultimately, heal conflict. This tour is a journey of Self discovery, heightened by the access to ancient sacred sites, and translated into present day insights that bring us into deeper connection with Spirit, through the celebration of our own unique preciousness. Please check out the following detailed information and itinerary for the trip. We would love to serve as your guides and companions. 11.07.10 - We unite our group for travel to Cairo, in the JFK Airport in NY, and depart at 10:00 pm, sleeping peacefully on the plane. 11.08, DAY 1- Arrive in Cairo at 4:30pm, and check into the amazing Mena House Oberoi Hotel, which has all of the accommodations of a 5 star hotel, including a pool, gym and views of the Giza pyramids. We unite for a group orientation, adjusting ourselves to the energy grids of Egypt, and relax. 11.09, DAY 2- We get up very early for a private Sunrise ceremony at the Giza Pyramid Plateau. We align with the Halls of Amenti, tune into the bridge between the land of Egypt and the Sirian star system, and connect to the energy shafts underneath the pyramids, and the sacred geometry of the Giza plateau. We then proceed to the Sphinx for another private visit and energy ceremony, aligning ourselves with the Hall of Records, the underground temple and other multi-dimensional components of the Sphinx, the Guardian of Knowledge. 11.11, DAY 4- Early morning flight to Aswan City, where we transfer to our deluxe bus for a drive through the ancient Sahara Desert to Abu Simbel. This is a magnificent temple hewn into the mountain for Ramesses II. The temple greets us with four colossal statues of Ramesses II. Between them is an entrance to the Osiris Hall which is decorated with detailed scenes of battles that the pharaoh won. Beyond the Hall is a sanctuary of Ra, Horus, Ptah and Amun. And there is more. There is a second temple, not any less amazing, that is dedicated to Nefertari, who is Ramesses’ beloved Royal Wife. This second temple is a sanctuary to Hathor who represents sensual pleasure, dance and sound. Both temples are also an engineering marvel – in 1968 they were dismantled, transferred, and perfectly reassembled on higher ground, because of the flooding created by the Aswan Dam. 11.12, DAY 5- We drive back to Aswan, where we settle into our luxurious cruise ship, the Sonesta Nile Cruiser. After lunch on board, we go for a sail on the well-loved felucca sail boats, a style of boat created by the ancient Egyptians. We visit the Temple of Khnum on Elephantine Island. The ram-headed archetype, Khnum, which holds the universal secrets of uniting the Mer-Ka-Ba (body to energy to soul), represents the ordering principles of the DNA, in all life forms. Resonating with Khnum’s presence will help us to internally organize our energetic and biological systems, preparing us for our next steps on the journey. 11.13, DAY 6- We will hold a private Isis Sunrise energy ceremony at her island temple at Philae. Isis holds the power of divine feminine support, nourishment and sexual magic. This is the place to feel nurtured and to reawaken the heart chakra. Then we visit the new and excellent Nubian Museum. After lunch on board, we sail to Kom Ombo, and visit the Sobek Temple, where we will learn to connect to our own, inner destructive Dark energy, in order to transmute it. The crocodile-Sobek is an intuitive, ‘survival power’ archetype, who holds the wisdom to help us defeat our limiting fears. He shares the temple with Horus, who signifies the balanced reconciliation of opposites. 11.14, DAY 7- Sailing through the night, we arrive at Luxor (also known as ancient Waset, and Thebes) and visit the necropolis on the West Bank of the Nile, and explore the amazing ‘Book of the Dead’ drawings in the tombs of pharaohs in the Valley of the Kings. Here we work with the ability to let go and move on, embracing the new, and as yet, undiscovered power that rewards our courage to release the past. We proceed to the mortuary temple of where we tune into the multi-dimensional portals (doors of different sizes Medinet Habu, for different energy beings). Then a visit to the magnificent temple of Queen Hatshepsut in Deir El-Bahari, tuning into her journey as a female pharaoh. 11.15, DAY 8- In the very early morning, we travel by bus through the beautiful countryside to Dendarah, to visit the Hathor Temple, and there connect to the multi-dimensional Hathor beings, and learn how they help the Earth. The Hathorian power of sound awakens sensual juiciness and the desire for life, which is the vibratory dance of wholeness. We will also laugh and meditate in the Chapel of Nut. Then we travel on to Abydos, to the ancient Osirion Temple, where we study the carved reliefs, which reveal ancient rituals and also, view the ‘Flower of Life’ symbols on the walls of the temple. 11.16, DAY 9- In the very early morning, we visit the Karnak Temple for a sunrise ceremony of knowing and healing in the Chapel of Sekhmet. 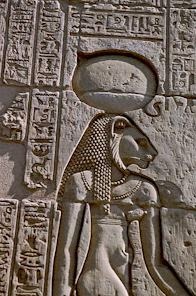 Sekhmet represents the passionate, destructive energy necessary to break old patterns in order to incorporate wisdom and healing. She is the wise power, the authority of inner leadership, which is so needed in the world today. The power of Sekhmet cannot be tamed. It must be owned. It is the fierceness to stay conscious in the face of the hypnotic pull to fall into negativity. We stand in front of Sekhmet’s statue, and feel her power igniting our own. 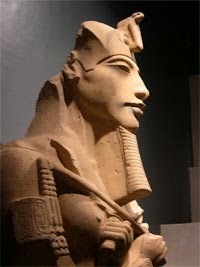 We will walk on the Avenue of the ram-headed Sphinxes, (created in the Age of the Ram) that previously connected the Karnak and Luxor Temples, for a distance of 2 miles. 11.17, DAY 10- We take an early morning flight from Aswan to Cairo, checking into the Mena House Hotel at Giza. In the late afternoon, we are privileged to have a private 2 hour visit inside of the Great Pyramid, where we experience a ceremony of remembering, transformation and alignment of the past to the present. 11.18, DAY 11- Early morning flight to Jordan, arriving at its vibrant capital city, Amman, where we embark on a tour of its old and new areas, and visit the Citadel, the Roman Theater, and the Old Souq. 11.19, DAY 12- We drive south along the ancient King’s Highway, one of the oldest trade routes in the world, running 200 miles along Jordan’s hilly backbone. We stop at the Byzantine Church of Mt. Nebo, then proceed to Madaba, known as the City of Mosaics. 11.20, DAY 13- Today we visit Petra, the place where the Being known as Pi is infusing her energy (click here for more information about Pi.) Petra, one of the Seven Wonders of the world, is the 6th century ‘lost city’ of the Nabateans, carved out of redish-pink towering rock cliffs, it was at the crossroads of ancient trade routes for hundreds of years. 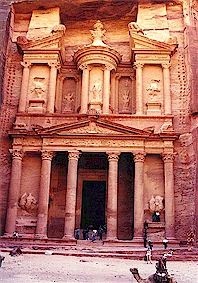 We begin our exploration of Petra early in the morning on Bedouin-guided horses, passing through the fabled Siq, an immense, narrow, sandstone passageway, which opens out to reveal the stunning Treasury of Petra. Petra contains an energetic Orb of Light, which is filled with the energy of peace. Because of this, Pi chose this location to anchor into in 2010, thus amplifying opening of the heart, forgiveness and peace on Earth. We continue exploring the hundreds of ancient temples, royal tombs, roman theaters and houses that make up this priceless place. So many layers of history are recorded here. Upon our return to the Movenpick Hotel in the evening, we will have a Farewell Dinner, to celebrate Pi and ourselves!